5 Facts That Members of the ‘Boycott Israel Movement’ Should Consider Before Boycotting Israel and Israeli Made Products. Fact – Israeli companies provide secure jobs and income to thousands of Palestinian workers. Large Israeli owned Industrial parks located in Samaria and Judea are home to hi-tech and food production companies. These modern production plants openly hire Palestinian employees. Fact – There are few Palestinian owned industrial parks in the entire Palestinian territory which explains why local Arab workers are attracted to the Israeli companies for a source of income. Fact – The salaries the Israelis offer to the Palestinians are higher than those Palestinians receive from Palestinian companies. Israeli unlike Palestinian employers offer their workers social benefits, and job security. Arab workers prefer to work for Israeli companies because of the greater benefits and security they receive over those offered by Palestinian companies. Fact – Israeli companies recognize and respect the customs surrounding Arab Holidays and offer their Palestinian employees special religious consideration. Fact – Palestinian workers at Israeli businesses that are hurt by the Boycott Israel Movement are the first to pay the price when Israeli companies are forced to cut jobs. 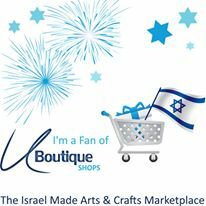 Nachman Klieman, Chairman of U-boutique.com , is an American living in Israel, who promotes and supports Made in Israel products as a means of countering the anti-Israel BDS boycott movements through an active ‘BUY-cott’ program.